Easy way to back up your profiles in various os's. Mine crapped out the other day, just like good ol Cod4 . Here's an easy way that you can do mindlessly. 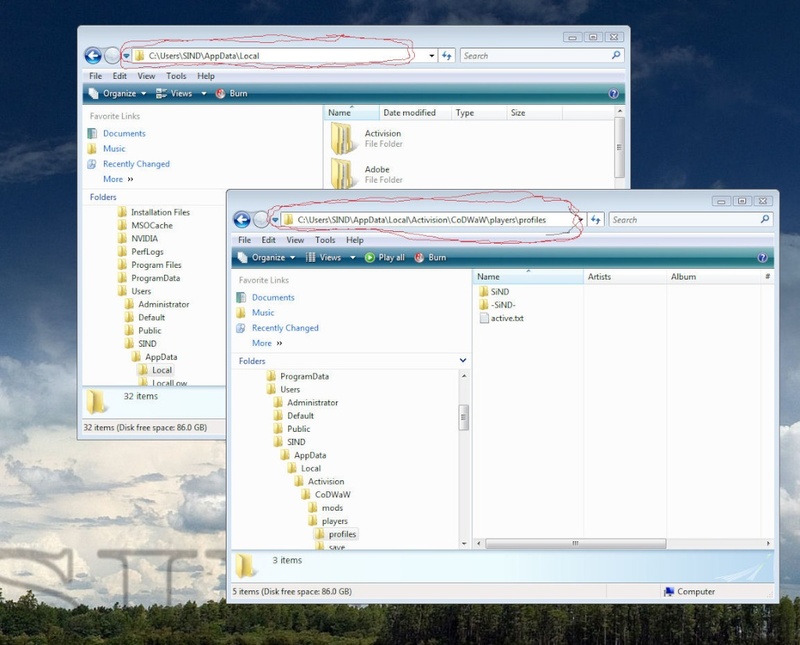 For XP: copy these into a batch file. %backupcmd% "%USERPROFILE%\Local Settings\Application Data\Activision\CoDWaW" "%USERPROFILE%\My Documents\CoDWaW Profile Backups\COD5Backup-%folder%"
%backupcmd% "%USERPROFILE%\AppData\Local\Activision\CoDWaW" "%USERPROFILE%\Documents\CoDWaW Profile Backups\COD5Backup-%folder%"
THIS IS FOR WHEN U GET TO LVL 65.... AND YOU ARE NOT SURE IF U WANT TO MOVE ON TO PRESTIGE AND LOSE ALL YOUR GUNS! AND PAST INTO THE NEW FOLDER THAT YOU WANT TO DO PRESTIGE ON OR WHAT EVER. NOW YOU CAN GO BACK AND UN-HIDE THE FILES AND FOLDERS. BOOT UP THE GAME AND NOW YOU SHOULD HAVE 2 PROFILES TO CHOOSE FROM..... NOW YOU CAN HAVE A 65 AND THE OTHER YOU CAN DO PRESTIGE ON. IS THIS EASY TO UNDERSTAND::::::?